Hi, I am interested in your 1930 Ford Model A (stock #c597CR) listed on Autotrader for $34,990. I'd like to get more information about this vehicle and confirm its availability. 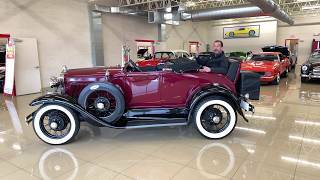 1930 Ford Model A rumble seat Cabriolet, showing only 88 miles since the complete nut and bolt restoration. Mirror finish two tone Ford Maroon and black paint show waxed and detailed. All new black front and rumble seat interior. New black canvas convertible top with zip out side curtains. Freshly rebuilt 201 cid engine with 3 speed transmission good to over 65 mph. Hand laced black powder coated wire wheels with wide whitewalls and great looking side mounted spare. Stainless exhaust system Real deal working ooogaahh horn. Restored running boards. Just a beautifully done example that is approaching 100 years old and can be driven like it was 1930.